Can you travel to the land of deep-dish pizza and beef hot dogs buried under pounds of condiments, not eat meat yet still eat flavorful, inventive food? The answer is yes. Yes, you can. During my trip to Chicago earlier this month, I ventured out from the South Michigan Avenue/Grant Park neighborhood, took a cab ride north along Lake Michigan, and found The Chicago Diner, which this year celebrates 30 years of cooking non-meat cuisine. I have to thank tweeps on Twitter for suggesting this place, for I had never heard of it. 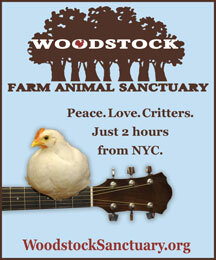 Apparently, it’s been mentioned as a favorite among the founders of Woodstock Farm Animal Sanctuary. I visited the Halstead Street location, aka the Mother Ship, and found the place almost packed on a rainy Thursday night. Looking like any typical diner with red vinyl seating and quirky vintage-esque signage, you would expect chunky fellas with tattoos frying chicken steak behind the grill. Staff had tattoos, but most were svelte, wiry types busily arranging blackened tofu on a plate, stacking a vegan sandwich or hustling blanched greens to tables. I tried to imagine what this place might have looked like in 1983 when badmouthing meat was not only anti-Midwestern, but anti-American. In fact, even today, despite all the buzz about meat and its impact on health, red meat still accounts for 58 percent of meat consumption in the United States; 22 percent of meat Americans eat is processed meat, like bacon and hot dogs and other pink slime concoctions. As a vegetarian about eighty-five percent of the time (I think I eat less meat than what qualifies for Mark Bittman’s term: flexitarian), I find those figures galling. Whomever frequented Chicago Diner 30 years ago, it was enough to keep business thriving and allow the owners to open a second location. Perhaps those having dinner that night are among the minority who believe that meat doesn’t have to be a dietary staple? Maybe the owners of Chicago Diner had tapped into a need that wasn’t being met in the Windy City? I could see why, because the food was excellent and worth a 20-minute, $20 taxi ride through traffic and rain. Chicago Diner focuses on simple and delicious, serving vegetarian and vegan options of American classics like the Reuben and a “BLT” Burger. 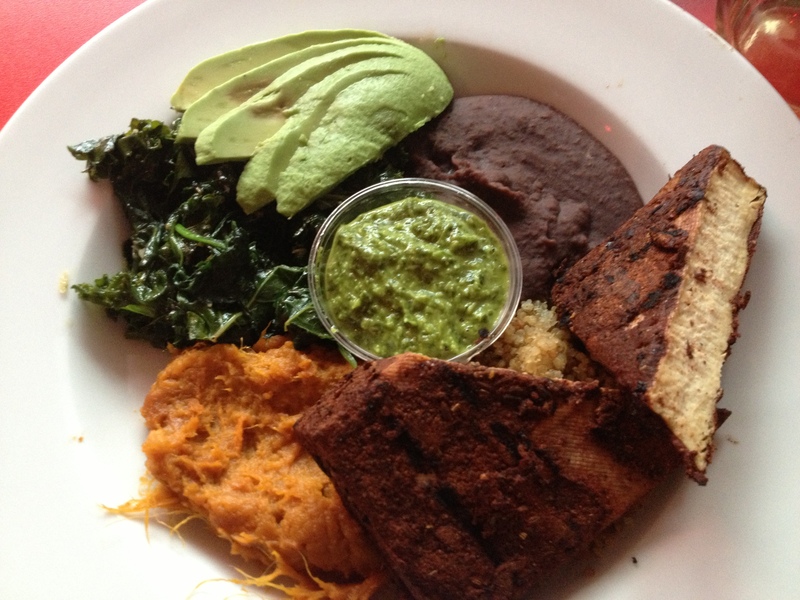 My colleague and I both ordered blackened tofu with mashed sweet potatoes, beans, avocado and greens (pictured above), an entree that was as savory as it was filling. And not the gross kind of filling you feel after eating a hot dog, which I haven’t done since the Washington, D.C. Kite Festival in 2002 because it made me sick to my stomach. 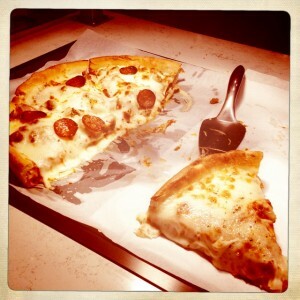 So Chicago Diner was a hit, and I hope to return, but how to eat meatless at the Chicago airport where every 10 yards is some food stand selling burgers, hot dogs, and greasy pepperoni pizza (which is every American airport)? Enter Rick Bayless, who by no means is a vegetarian (the guy loves his lamb), but he’s one of Chicago’s most innovative chefs pushing boundaries in Mexican cuisine. Yes, his sandwiches at the chain Tortas Fronteras in Terminal 1 at Chicago O’Hare Airport cost more than a McDonald’s patty next door, but put your suitcase down and enjoy every bite because Bayless’s takeout food is scrumptious and worth a flight delay. Most of the sandwiches feature meat, but for $9 there’s the roasted cremini and shiitake mushroom sandwich with chipotle, garlic, goat cheese, black beans and arugula. I was eating alone when I tried this, and let’s just say I wasn’t dainty about tackling this sandwich. It was a tad messy, extremely delicious, and worth the cost of four McDonald’s pink slime burgers. I wish Tortas Fronteras offered gluten-free options since I had to pick the bread off my sandwich, but, hey, gluten-free appears to be trending lately, so I have hope. This entry was posted in Chicago, Food, Travel and tagged Chicago, Chicago Diner, foodie travel, Rick Bayless, vegetarian cuisine on May 29, 2013 by katrina.